Natural history: The sedentary form of Elysia rufescens is commonly found in beds of the green algae Bryopsis, often occurring in mixed populations with the sedentary form of Elysia marginata. Such Bryopsis beds usually grow in highly protected to moderately exposed back reef locations at depths of < 1 m (< 3 ft). Mature animals show little change in behavior day or night. (Note 3) The migratory form is moderately common in moderately protected to moderately exposed rocky habitats. It occurs from the low intertidal to about 3 m (10 ft). Mature animals are diurnally active but rest in the open at night. We've observed the sedentary form feeding on Bryopsis in dishes. A migratory animal laid a tightly coiled, white egg mass without extra-capsular yolk. Hatching occurred in about five days in the laboratory. Taxonomic notes: Elysia kushimotoensis Baba, 1938 may be a synonym. As suggested in Kay (1979), it seems likely that it was first reported from Hawaii in Pease, 1860 (as Pterogasteron bellum). It's probably the animal illustrated as Elysia sp. in Edmondson, 1946. The name means "becoming red." 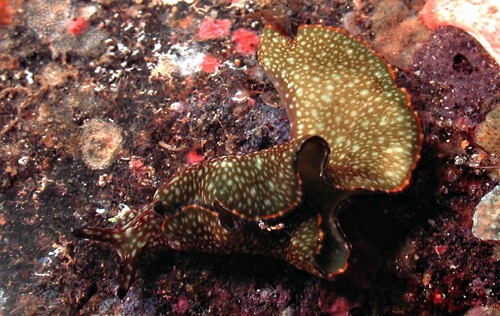 Photo: PF: sedentary form: found by John Hoover; Oahu; Sept., 1998. Note 1: A pale animal collected along with normal animals at Black Point, Oahu on Oct. 3, 1999 died when held overnight supporting the suggestion that such animals may be senescent (or diseased?) individuals that have lost their normal complement of chloroplasts and dietary pigments. Note 2: The marginal violet-black line largely disappeared over an 8-day period when a 4 mm animal was held without food (collected on Oct. 23, 1998 at Hekili Point, Maui). Similar fading has also been observed on other occasions. That supports the suggestion that the occasional absence of the character in the field may be due to diet. (see photos). Note 3: The tall parapodia of sedentary animals observed on Bryopsis (at Black Point, Oahu) were entangled in the algae making the animals difficult to extract. When collected, they appeared to have more difficulty crawling in a dish than most species. Also, there was no obvious damage to the algae in the field despite the relatively dense populations. That suggests the sedentary form may be an adaptation to a preferred host with the animals "sacrificing" mobility in order to increase the surface area available for photosynthesis by retained chloroplasts.